Chinese media is being heavily censored in the wake of the Yangtze river cruise ship disaster which has left at least 26 dead and more than 400 others possibly drowned. The cruise ship, the Eastern Star, carrying 456 mostly elderly people on board, overturned in bad weather on Monday night. 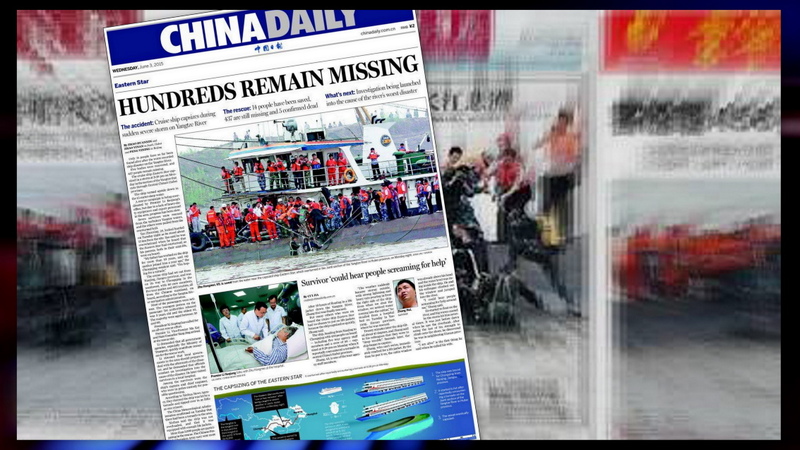 The censorship and media control began almost as soon as the boat went down at 21:28 local time [13:28 GMT] in the Jianli section of the river. Official media were banned from reporting the incident for nearly 10 hours [Sky News / BBC]. Some 48 hours after the incident questions are being raised over why the ship sailed into a storm [BBC]. But reports are being carefully controlled and kept within guidelines set by China's propaganda department. Officials have ordered outlets not to dispatch their own reporters to the scene and local journalists already there have been recalled [CDT]. Chinese journalists have also been told to focus on the "positive part" of the story, such as the successful rescue accounts, and ordered to use only information released by state-run outlets - CCTV and Xinhua [CDT / WSJ]. Only 14 passengers had been rescued by Wednesday evening, including the ship's captain and chief engineer who are in police custody for questioning. And now the relatives of the some 400 missing are beginning to ask questions as to how such a tragedy could occur. Anger boiled over on Wednesday as the lack of information led to frustration amongst some relatives of those found dead or still missing. Information on the disaster has been tightly controlled and officials gave little away during a news conference on Wednesday afternoon, providing no figures on deaths or survivors and taking no questions. A video shared on social media showed pushing and shoving between police and angry relatives outside a local government building in China's commercial hub of Shanghai, where many of the passengers hailed from. "The police first formed a human wall and didn't let us in. Then the relatives got excited and started to shout. Some policemen hit people," said one young woman whose mother was on the boat. The mother of seven-year-old Yang Chenlin who was on the boat with her grandparents, said relatives were desperate for more information. "We need to go to the site. That's our common appeal," she said [Daily Mail]. Media blackouts or strict controls concerning national disasters in China are nothing new. Following the 2008 Sichuan earthquake and the Wenzhou train crash media reports were highly censored [BBC / NYT]. More recently information and discussion surrounding the News Year stampede in Shanghai was also heavily suppressed [SCMP]. But despite criticism of such controls little has changed over the years. Indeed censorship and information control has arguably increased. Blocks haven't been confined to the Internet. Following the capsizing of the Eastern Star roadblocks were sited about two kilometres from the scene, with cars being turned back even before that point. Authorities also limited access for foreign journalists to a brief river trip. Journalists are even being barred from speaking to relatives of the missing passengers. And for companies like Sina there is a constant risk of being shut down should they not employ strong enough censorship controls. Indeed as recently as April this year the Cyberspace Administration of China [CAC] was quoted as saying they would "seriously" punish Sina, with possible measures including "a complete shut down of its Internet news services" if it did not improve its censorship, according to Xinhua [Telegraph]. Controls have tightened under China's current president Xi Jinping, and according to Reporters Sans Frontieres China ranks 175 out of 180 countries in its 2014 worldwide index of press freedom.